I haven't posted in quite a while, but I wanted to keep everyone posted as to the trends regarding Javier Solana, the push for an EU army, and the progress and relationship between those two things. Many important votes and meetings will take place in the coming weeks that should add further light to all of this. I plan to closely follow these events, and report back anything interesting I find. Yet in the mean time, I would like to provide a brief update as to what is going on. Germany has apparently taken on Solana's push for a "European Defence Union." Germany plans to actively push for a European Defence Union, which would include a permanent military headquarters, Council of Defence Ministers, and Permanent Structured Cooperation in defence. These are the main elements in the Solana plan. Furthermore, during Solana's "road show" the CEPS think tank noted that Germany was most receptive to the plan, and the German Defence Minister apparently gave a nod to Solana's plan when she called for strengthening a "European Defence Union," with the eventual goal to creating a European army. Largely to Solana's influence, the German White Paper on Defence notes that the German government plans to take a leadership role in the formation of a European Defence Union. This paper was scheduled to be released in June, but the UK Brexit referendum is coming up on June 23, so its full release is scheduled for after that vote, so as not to influence the outcome. Nevertheless, the paper was leaked and seen by the Financial Times. 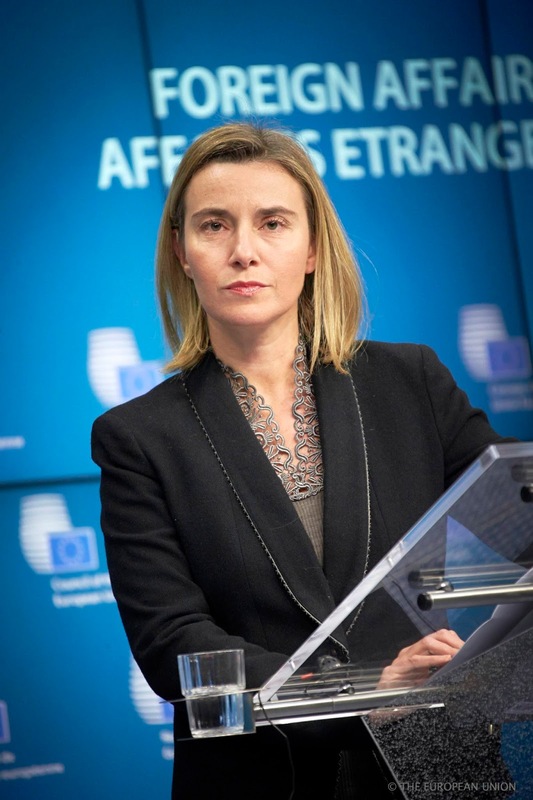 The EU High Representative, Federical Mogherini, has spent the last year and a half preparing an EU Global Strategy, which is the successor plan to Solana's 2003 European Security Strategy (ESS). She in the past has called for the EU to be a military superpower. There was a very lengthy consultation period for the EU Global Strategy. Even until now, only a handful of political and security committee (PSC) ambassadors could see the plan, and they had to leave their cell phones outside. This was not to influence the UK In/Out Referendum on June 23, since rumors of an EU army are swirling about. Nevertheless, hand written notes were allowed, and thankfully someone leaked those as well. The EU global strategy apparently sees an urgent need to upgrade the EU's capabilities and activity in defence, calls for a permanent EU headquarters, and Permanent Structured Cooperation in defence (PESCO). This is of course is very similar to what Solana was calling for as well in his 2015 Report addressed to EU HR Mogherini. This is similar to the Eurozone's "Eurogroup" in which only the countries who wish to participate do so. While Britain cannot be forced to join PESCO, this allows the EU to build an army without British assistance. 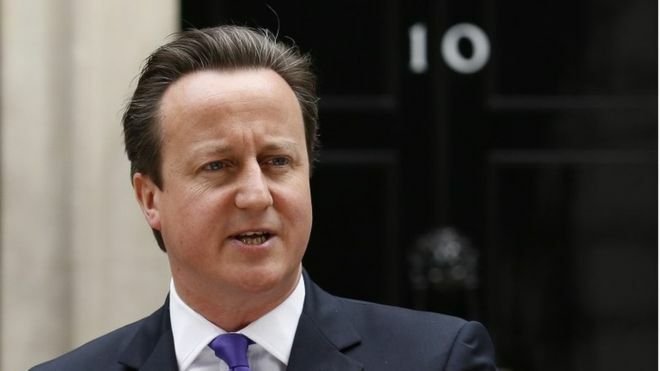 Though David Cameron may not support an EU army, whose to say a pro-EU successor won't sign them up to PESCO? Rumor has it that Merkel has a deal with Cameron that, in exchange for the UK-EU renegotiation deal, Cameron wouldn't block the creation of an EU army (presumably if other countires wanted to implement PESCO). The term "European Defence Union" was not widely used until the Solana report used it first. Curiously all other proposals for a "European Defence Union" have all the key proposals of the Solana plan. Furthermore, many powerful voices have gotten behind this in the past year or so. 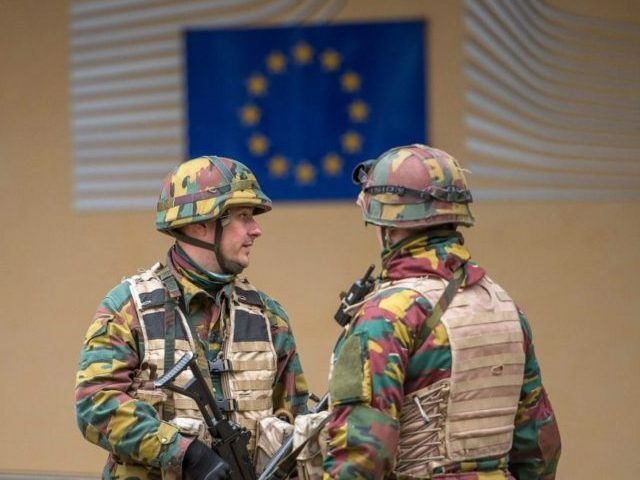 European Parliament just a month and a half ago, demanded the EU set up a permanent military headquarters and a "European Defence Union." The anti-NATO rhetoric of US Presidential candidate Donald Trump's has definitely put the pressure on the EU to put an EU army together. Even Obama and Hillary Clinton have long put pressure on allies to up defence spending. 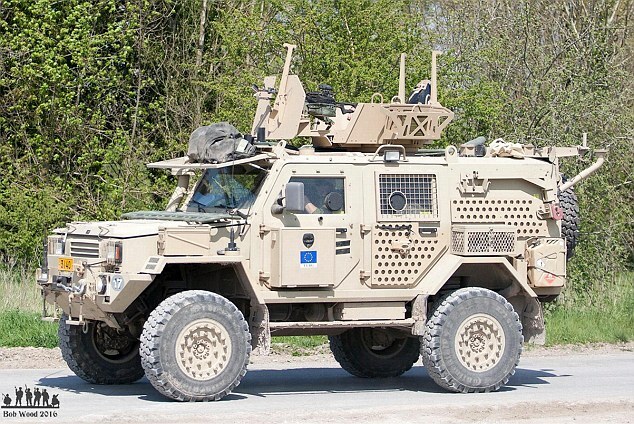 An EU battlegroup performed military exercises in Britain just this month, and it included two British battalions. The tanks had EU insignia on them. Of course, this is old news, but in March 2015, EU Commission President called for an EU army, a day before Solana gave his report. In an interview, Solana clarified that what was meant by a "European Army" was different than how some people were taking it. Knowing that those two are possibly good friends, their push seemed to be coordinated and planned. As you've probably already guessed, they are not as talkative about an EU army or any enhancements to defence cooperation until after the UK votes whether to stay or leave. They even moved the European Council meeting until five days later, where Mogherini's EU Global Strategy is expected to be discussed and/or presented, at least to some extent. This is why the Germans rescheduled the release of their defence White Paper, wherein they intend to take a leadership role in the creation of a European Defence Union that will eventually lead to a European army. Nevertheless, the polls were neck and neck, but "Vote Remain" has gained a significant advantage over "Vote Leave." I even invested money in the prediction markets, that the UK would vote to stay. It tends to be that last minute, people fear change and opt for the status quo. So if "Remain" is already ahead, it is likely they will win, especially if there is high turnout. Once this vote happens, and the European Council has its meeting, I expect people to talk more freely about a European Defence Union. I believe Javier Solana has fulfilled a few highly specific prophecies about the Antichrist. (Click the link if you haven't seen the slideshow yet, which underpins the message of this entire website.) They are so specific no one living or dead can match them. Nor are they your typical vague "young charismatic leader wants peace in the Middle east" prophecy movie types. See my powerpoint for an extensive discussion about why I believe this is very likely. 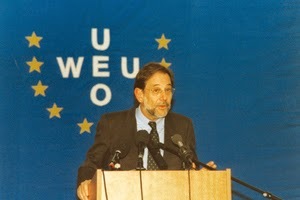 Javier Solana has not stopped advocating in EU related fields. He even presented a report to EU High Representative Mogherini's team, in Brussels. This was part of the EU's formal consultation process prior to the EU Global Strategy. Solana's report in March 2015, calling for a European Defence Union, was addressed to the EU High Representative Mogherini. His recent report on "Human Security" was also intended to influence policy decisions on her part. The text of the "Human Security" report is not particularly interesting, except for who co-chaired it (Solana) and what it was used for the past. The Human Security Study Group is something Solana founded to advise himself back in his days as High Representative for CFSP, to provide specific recommendations. Here Solana is taking it upon himself to take a lead role in the study group he commissioned for himself back in the day. There are lots of good reasons to believe that Javier Solana will not at all stop pushing for an EU army/European Defence Union. In March 2015, he said "I will put all the energies I have left to push forward this process" (CEPS Twitter account) when referring to European defence integration. Furthermore, back in 2009, when he "retired" he said "I am not yet ready for retirement" and stated he would keep working on the same things he always had been. He laid low and worked as an academic for a few years, but is coming back with a burst of energy, so much so that even one secular blogger believes that if the EU doesn't get too bogged down in the migration/debt crisis, that Solana would be appointed to an EU position. Finally, despite his age, it is very likely that Solana is trying to build a legacy for himself as one of the EU's founding fathers, in the same way Jacques Delors was the founding father of the Euro. I have extensively argued this point elsewhere, but in addition to it, I would like to point out that in his interview last year he stated that "It will be a very important step of the construction of the European Union." He also said, "This is a process. The sooner we start, the sooner it can be completed. If we don’t start, we will never finish." Very clearly, he sees himself as the one to get this done, despite not having any political power at the moment. Javier Solana gradually rose to power, and came into conflict with the "EU3" group for political influence in the discussions over Iran's nuclear program. He over came these three, as predicted in the Bible (see Daniel 7, where the Antichrist subdues 3/10 kings). Javier Solana created a program for Eastern European and Mediterreanean countries, so that they could form a relationship with the EU. This European Neighborhood Policy (ENP) ultimately turned into a 7 year program that cycles every seven years (see Daniel (9:27). In the future, Solana recommends using money from the ENP to use military force to stabilize the Middle East and North Africa, very reminiscent of expectations of a 7-year security covenant between a United States of Europe and Israel, brokered by the Antichrist. The powerpoint explains this much better, in relative to all of the relevant Scriptures, and has images that are more helpful in explaining it. Nevertheless, a big snag in the theory that Javier Solana is the Antichrist was hit in 2009, when he left political power in his late 60's.. This was widely regarded in the news, and by his team, as a "retirement," despite his desire to continue working in academia. Those who thought Solana was the Antichrist were mocked*, and the EU-Washington diplomatic mission spokesman said it is "quite insane" because Solana is a "retired" and "private elderly gentleman." As I implied before, an Antichrist that retires then comes back is not theologically ad hoc. It does seem strange that the Antichrist would retire, then suddenly come back. It sounds like we are constructing a "comeback" to save a dying theory. But in fact, theologically, this has quite a bit of precedent, as I already mentioned. Prophecies that don't appear to have large gaps between them ultimately do. For example, the disciples, even at the ascension, had no idea that the coming of the Messiah would happen in two separate phases, one where he dies for sins, and another where he returns thousands of years later! Same goes with the revived Roman Empire. Daniel 7 describes how God violently defeats the "fourth kingdom" when the Messiah comes on the clouds of heaven. The fourth kingdom is regarded by almost all conservative scholars as being the Roman Empire. The problem is obvious. How can the Roman Empire be defeated by God, at Christ's Second coming, if the Roman Empire died out long ago? The answer is clear. It must come back, just like Israel came back after thousands of years, so must the Roman Empire. One major event in the end times is the ten kings give their power and authority to the beast. The "beast" is synonymous with the Antichrist and/or his kingdom. (A king can't be king without a kingdom, and vice versa.) The ten-nation Western European Union military alliance, that was used by the EU to conduct military missions, transferred almost all of its capabilities to the EU under Solana's head, at Recommendation 666. I have gone into detail into why I believe that is historical as of 2001, in this article here. Nevertheless, when reading the rest of the passage, it seems to reiterate what it already says. I post here the entirety of the text, in NASB, to demonstrate this point. 2 The ten horns which you saw are ten kings who have not yet received a kingdom, but they receive authority as kings with the beast for one hour. 13 These have one purpose, and they give their power and authority to the beast. So here it seems that the beast (Antichrist) and his ten kings hate end times Babylon, whoever that is. They apparently violently destroy this city and "burn her up with fire." So it seems this is a military activity to say the least. Since the harlot rides the back of the beast (see Revelation 17), it seems the Antichrist and Babylon are initially allies. But this apparently doesn't last. The ten kings and beast have a "common purpose" by which they destroy end times Babylon. So it makes sense this common purpose is in the military domain (hence, a common purpose on defence issues: Common Security and Defence Policy). Some theologians even believe that the one riding (i.e. the prostitute) is the one with the influence. Notice how it says that the ten kings have "one purpose." This is the same phrase in Greek as "common purpose" in verse 17 later on. Literally, it is "one mind," which is how the ESV renders it. Both verse 13 and verse 17 say the same Greek phrase. Notice the apparent repetition in verses 12-13 and verse 17. I have argued elsewhere that verses 12-13 are most likely a past event that took place in 2001, after Recommendation 666 was implemented. However, it kind of "fast forwards" to Babylon's destruction and reiterates that the ten horns have a common purpose and give their "kingdom" to the beast. Since EU defence policy still remains largely intergovernmental, verse 17 does not seem like a past event. Interestingly, in Solana's surprise EU defence integration push, giving up sovereignty in defence is precisely what he is trying to get the member states to do. Is it exegetically ad hoc to place verses 12-13 in the past, and verse 17 in the future? 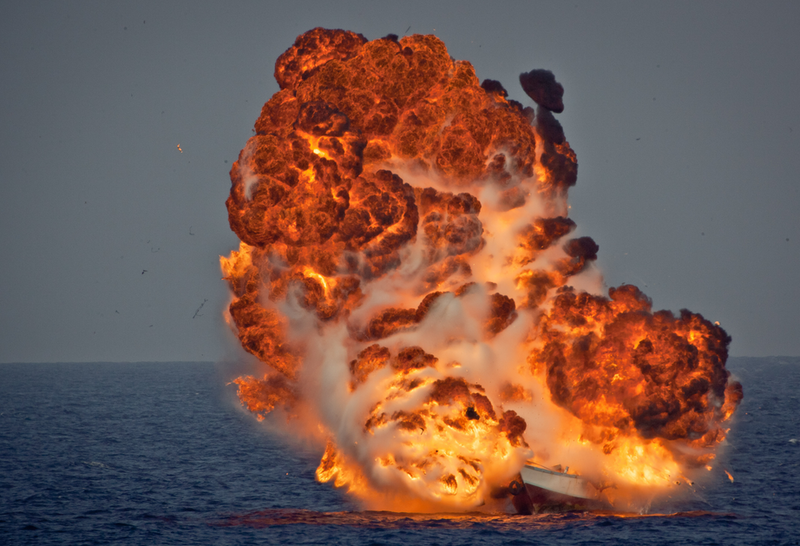 If we look at another prophecy, the destruction of Tyre, we have precedent for a passage that sounds like one decisive event, but is actually two. In retrospect, the text allows for this. See this article here to see what I mean. God prophesied that Nebuchadnezzar would destroy the city of Tyre. He did most of the job, but later on, Alexander destroyed the island portion. When reading the text, it actually allows for it, as the pronoun changes when discussing Tyre's attackers. Not to mention the "revived" Roman Empire, first and second coming of Jesus, restoration of end times Israel, and the entire "mountain peaks of prophecy" phenomenon allows for this. I think it is especially allowable in Revelation 17 because of the deliberate repetition and the "fast forwarding" to Babylon's destruction. Solana completed verses 12-13. We are witnessing him attempt to whip up the "common purpose" again, and get more integration in the defence domain. I admit I shake my fist at heaven from time to time. But one thing that God does, is he doesn't do things when we expect them, but he does them exactly as he said, no matter how long it has been or how bleak the situation looks. Hallelujah and praise to our God in Christ Jesus, forever and ever! *This website has no affiliation with the group mentioned in the Newsweek article, the Hutaree militia, who also thought that Javier Solana might be the Antichrist. As I understand it, the Hutaree were exonerated of all the attacks they were alleged to have planned. **This "againts all odds after a long time" prophetic principle does not apply if someone intensely hopes that God will come through in some instance, if he has made no explicit promise. It only seems to apply when God has made an explicit promise, or already partially fulfilled prophecies, only to turn them around at the last moment. Thank you! Good to hear from you! Blessings to you!